In Theresa May’s ‘Brexit speech’, on January 17th 2017, the prime minister suggested that Britain’s “history and culture is profoundly internationalist” . This is certainly one way of framing Britain’s historic relationship with the rest of the world. Alternatively, you might suggest that May spelt “centuries of colonial rule, oppression, slavery and genocide” wrong. As cultural sociologist Iwona Irwin-Zarecka argues, the range of possible interpretations of historic events and themes can be limited through processes of ‘framing’ . Such ‘framing’ doesn’t necessarily block out other possible interpretations, but it does act to restrict the range of meanings. The past can be ‘framed’ in certain ways, and certain interpretations and narratives can be promoted over others in ways which obscure less palatable aspects through specific, and active, memory-work: through commemorative ceremonies, memorial design, and yes, political speeches. There have been a series of public history interventions recently which have sought to re-engage with some of the so-called ‘forgotten’ sides of the more horrific stories of the history of the British Empire. Britain’s long and meticulously organised involvement in transatlantic slavery has come to light publicly through the work of the Legacies of British Slave-ownership project at UCL, and the accompanying documentaries presented by David Olusoga, titled, ominously, ‘Britain’s Forgotten Slave Owners’ . The problem with the use of the term ‘forgetting’ here is that it just doesn’t capture how much effort it takes to ‘re-frame’ a history as brutal and horrific as, for example, empire into something as progressive-sounding as, say, ‘internationalism’. Forgetting certain aspects of a nation’s past takes work. Forgetting something as epic as transatlantic slavery and the slave trade, something which saw the transportation of 12 million African people, four centuries of trade in human beings, isn’t something that’s easy to ‘forget’ by letting it slip the collective mind, like a careless omission. This isn’t the ‘dude, where’s my car?’ of historical memory . Saying that transatlantic slavery has been ‘forgotten’ just doesn’t do justice to the lengths people have gone to obscure this history, reworking the memory of slavery into the memory of its abolition, for example, through the valorising of heroes (William Wilberforce) and the celebration of key dates (1807, 1833/34). This distinctly active process might better be termed an ‘organised forgetting’  or an ‘unremembering’  to indicate the work needed to obscure certain pasts. One of the ways in which the connections between British history and transatlantic slavery have been forgotten in an organised way, is through the framing of this past through a distinctly ‘maritime’ lens. Helpfully, this also chimes well with national identity narratives about Britain’s maritime Empire and prowess, Britannia ruling the waves, commanding the seven seas, in images sometimes coupled with comforting national narratives of abolition; of Britain being a country “that took slavery off the high seas” as David Cameron once put it . The ‘maritimization’ of the history of Britain and slavery, as John Beech has argued, has placed a focus on the slave trade rather than enslavement more broadly, severing connections to land-based plantations in foreign lands (safely at a distance) or to legacies closer to home, on British soil, like industrialisation or material culture (pretty Georgian squares and decadent country houses for example). The thing about memory, rather than remembrance  is that it doesn’t always abide by the organised rules of active forgetting. As much as the authoritative, ‘organised’ framing of slavery through a maritime lens may act to obscure the breadth and depth of this history through displacement, distancing and downplaying, this ‘maritimization’ can also reveal human realities and consequences of a history left otherwise muddied in the Mersey. In Liverpool, maritimized connections to the city’s past reveal themselves through mythologies surrounding ‘slaves in Liverpool’. Stories of a slave presence, though dissonant and contested, hook onto places which run along the memory of the 18th century river Mersey’s edge, before it was pushed back by later dock construction on reclaimed land. Such stories ‘hook’ in particular onto the historic site of Goree, eighteenth century warehouses named after an island off the coast of Senegal, the largest slave-trading centre on the African coast, and now a UNESCO World Heritage Site . 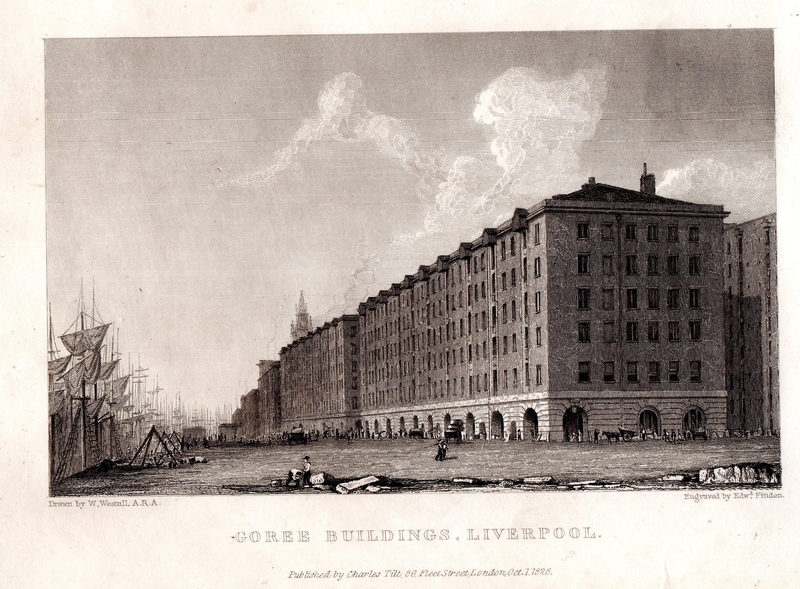 Though demolished in the 1950s, Goree warehouses have continued to be the imaginative site of memory where an otherwise romanticised and obscured history of the trade in human beings is remembered. Stories of enslaved people shipped, sold, and chained to rings at the site, historical evidence unearthed in cellars around Goree, and obscure sculptures which commemorate the water’s edge, all simultaneously reveal and obscure the mythologies of slaves in Liverpool. As much as maritimizing has ‘framed’ the history of slavery as something seabound and distanced, maritime connections, made at the places where the land of Liverpool meets the water of the Mersey, have dislodged this frame, turned it backwards, revealing human connections. Irwin-Zarecka, Iwona. Frames of Remembrance : The Dynamics of Collective Memory. New Brunswick: Transaction Publishers, 1994. For younger, and/or more culturally sophisticated readers, Dude Where’s My Car? Was a 2000 film starring Ashton Kutcher and Seann William Scott in which two ‘dudes’ forget where they parked their car after a heavy night. Derek Whale, “Fishing Village to a Great Seaport” City of Liverpool Charter Celebrations 1207-1957: Evening Express Charter Supplement, Liverpool Evening Express, June 17, 1957.